As summer approaches, many of us prefer to dine outdoors and start heating up our grills to prepare the evening meal. Grilling is often a very healthy and quick way to prepare meat and seafood, and by grilling a selection of fresh vegetables as your side dish you can escape the heat of the kitchen completely. I first tasted swordfish cooked like this in Sicily, and it has since become my favorite way to prepare swordfish. Simple yet delicious, it can be made in mere minutes. Although you could top these swordfish steaks with a seasoned herb olive oil, or a zesty tomato relish, I prefer to serve it simply with lemon wedges. 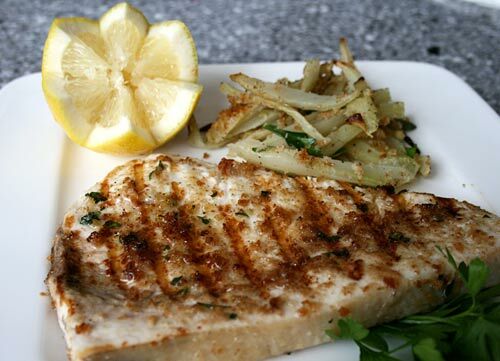 Swordfish is a low fat, healthy protein. Using whole grain breadcrumbs adds nutritional value. Olive oil is a heart healthy, mono-unsaturated fat. Grilling swordfish in this manner keeps it moist and delicious. Bread the other side as well, pressing the crumbs onto the sides of the fish so they stick. Fire up the grill, and once hot, cook the steaks over medium heat just a couple of minutes on each side. Serve immediately, with lemon wedges on the side.